I thought this was a handsome and generous survey of this leading illustrator of the forties and fifties. Albert Dorne was part of a small group of artists whose work was everywhere in popular consumer magazines back then (though he never did a Saturday Evening Post cover) either as part of the editorial or art for an ad. The book has dozens of his illustrations so you can really appreciate his style and in particular his speciality: crowd scenes. The two on page fifty-four and the four on pages seventy-two and three are just stunning. Of course, like any professional artist, Dorne was a skilled draftsman and nicely the book includes a few preliminary sketches for paintings that clearly show how good he was with just a pencil. Page 118 has a parade (another crowd scene) done in pen and ink that looks just perfect. Dorne's work is in three sections in the book: magazine work; war illustrations; ad art. Each has plenty of examples though I was disappointed that, in the ads pages, there are only three examples of his lovely paintings he did for the Wurlitzer Company in the mid-forties. I think there were at least twenty in the long running campaign. As well as examples of his work David Apatoff contributes a short biography of Dorne's career and his work with the Famous Artists Schools and there are three other text pieces which I thought were mildly interesting. The book is well produced though if I have a criticism it is that some of the pictures are a bit too small despite plenty of available space and perhaps missing is a page or two about Dorne's technique: how did he use his extensive reference file; what type of pencils, brushes, paints and paper were used, how were the colors applied et cetera. This would really have made the book complete. Unfortunately these three are the only examples of Dorne's beautiful illustrations for a Wurlitzer ad campaign in the late forties. I received this book last week, and I was also mildly disappointed. 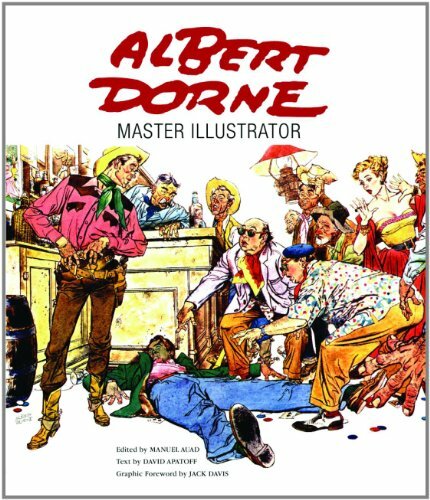 The artwork is great and this is the first book that compiles Albert Dorne's work so I think it's a great buy, it's just that I would have really liked to see big pictures of his pencils...especially of the crowd scenes. I'm the type of person who's more interested in seeing the initial stages of a drawing than the final artwork so I have that particular bias with art books.